Good Day Rome is on-the-road this week. We head back to Rome this evening, but I wanted to share a few pictures from the last couple of days. We are traveling with our Seattle-based niece, nephew and their children. Hoping Grandma Deb, who is cycling across the U.S. this summer, has a chance to see these pics of her grandchildren and their time in the mountains. 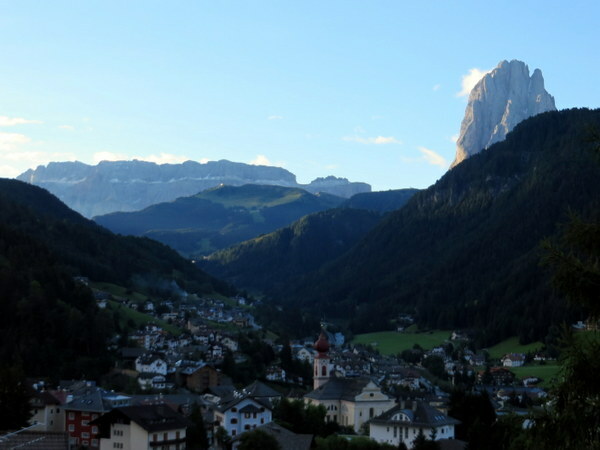 Sunrise on the Sella Group and the Sassolungo, towering over Ortisei, Italy, as seen from our terrace. 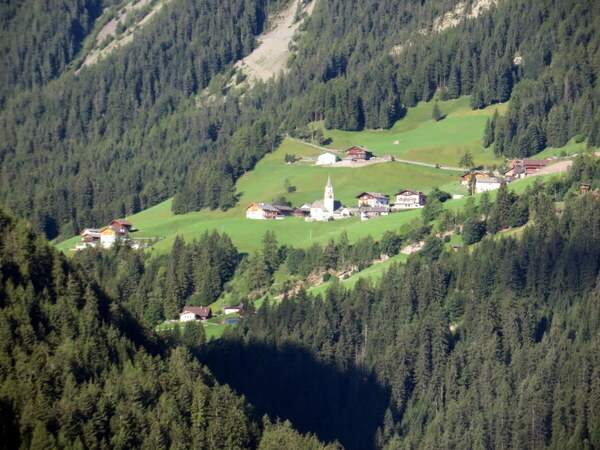 Across the Val Gardena, viewed from our apartment, the tiny village of Bulla. Every trip I say we need to go there. I find it enchanting. Maybe next time…. 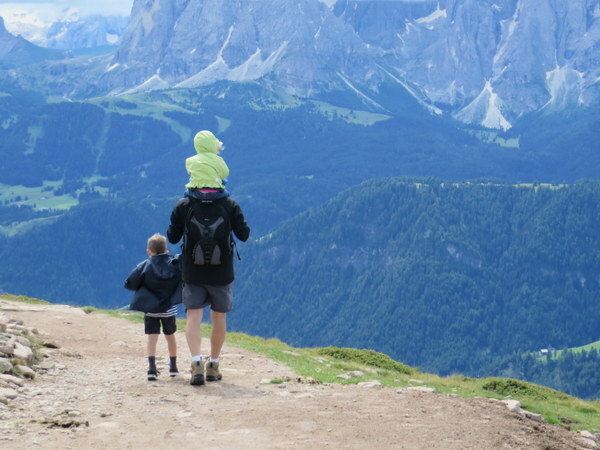 High above the Val Gardena, William, Elizabeth and John head down the trail. It was a chilly 13 Centigrade. 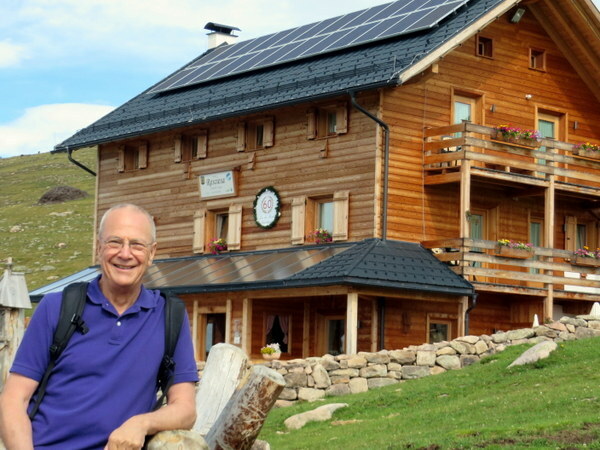 Ric in front of the rifugio at Rasciesa, high above the Val Gardena. Lovely stop for “elevensies” of coffee, hot chocolate and berry crostada. Yes, it was cold enough for hot chocolate. 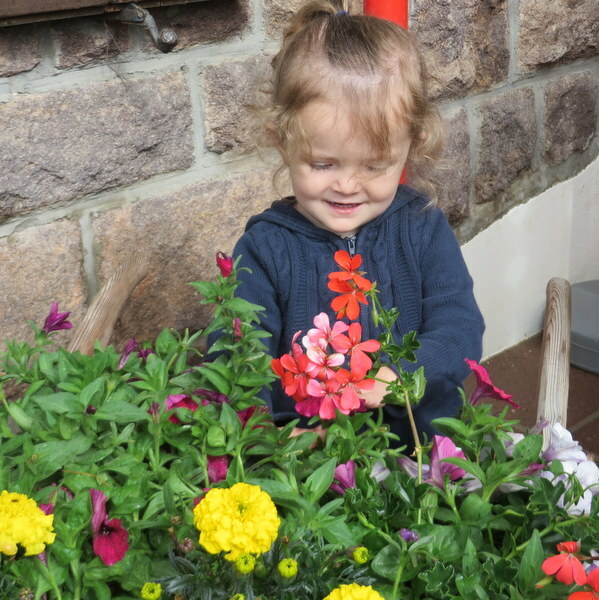 Elizabeth cannot resist the flower displays. The Val Gardena is well-named. 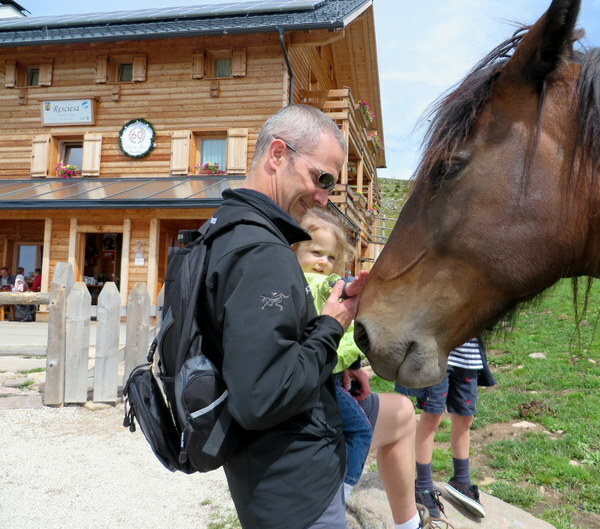 Horses and cows cross paths with hikers at Rasciesa. We encountered a herd of about a dozen horses looking for handouts and petting. William said it was the highlight of the hike for him. 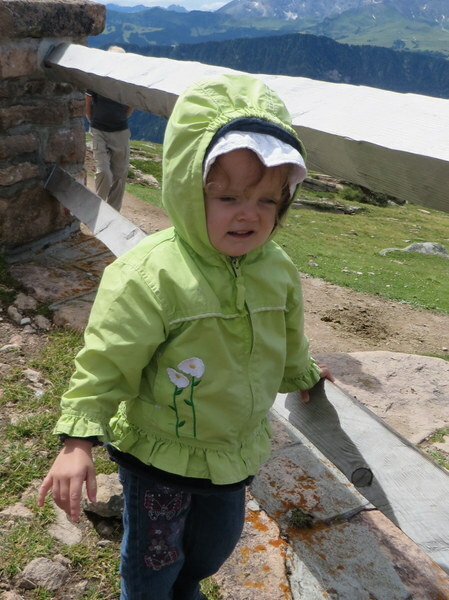 Caught Elizabeth in a candid moment, bundled up against a chilly breeze at the high altitude. In the valley we did not need jackets. 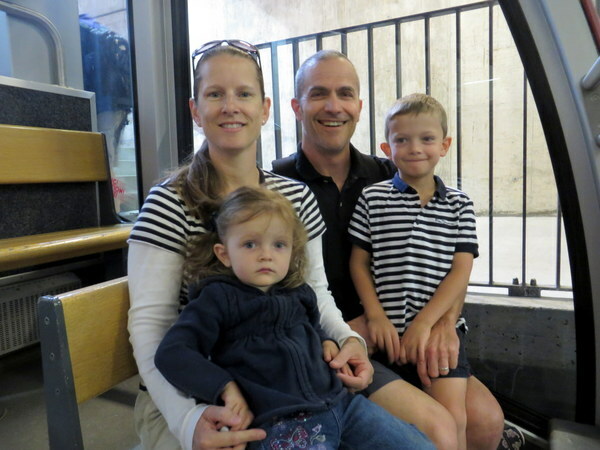 Susan, Elizabeth, John and William riding the funicolare to Rasciesa, Val Gardena. 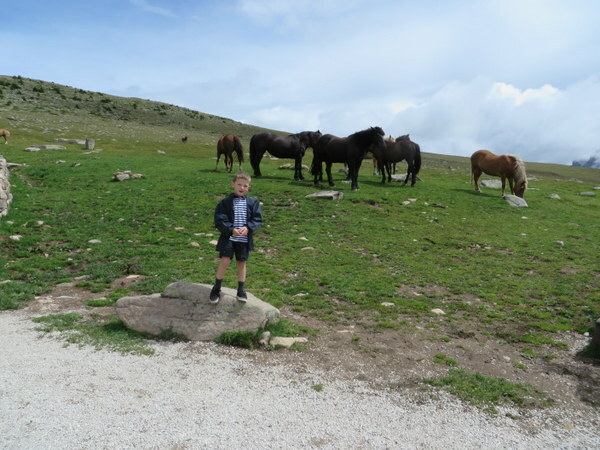 The horses were very friendly. No doubt looking for apples and carrots. John, Elizabeth and William (hidden) offer some pets. Ciao tutti! If you haven’t been here, you should put it on your list! Wow! This are looks absolutely spectacular! Hot chocolate….amazing it was that chilly. Well I have to say, chilly to someone living in Italy is different than chilly to an Oregonian. We’re a little worried about how cold Portland may feel when we visit in October. Love the horses, of course. 🙂 Sounds like a nice trip to beat the summer heat. The horses were so sweet! Wish we’d brought carrots in our pockets! We returned to true summer weather last night. Ugh! Laurel, Ric all the peeps and horses in these pictures look great! I love your hair, Laurel. 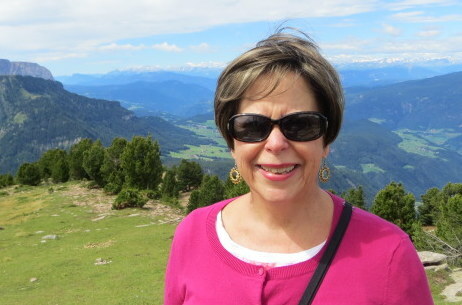 I’m thinking when your assignment ends, you are going to be swamped with offers to stay and continue to promote Italy with your wonderful reviews! Sounds like a really good paying job to me. Thanks Carolyn! Wouldn’t that be a dream job! If someone would just pay my hotel bill it would be enough! Well, that isn’t unheard of. And pay your food and wine and travel expenses!! Wow! Wouldn’t mind going there for a week or so! Hello Madison, thanks for reading. We are thinking about 2 weeks next year.